The 11th annual Strictly Business event featured more than 90 businesses and business organizations and welcomed more than 700 attendees. 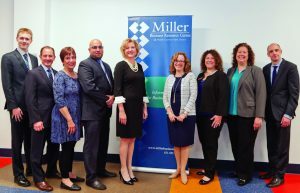 This partnership between the library’s Miller Business Center, the Greater Middle Country Chamber of Commerce and the Brookhaven Chambers of Commerce Coalition was created to promote local businesses and encourage economic development in the region. Thanks to our sponsors: TD Bank, Empire National Bank, Suffolk Federal Credit Union, M&T Bank, Synergy Wealth Strategies, Campolo, Middleton & McCormick, LLP, The Empire Group at UBS Financial Services, Endeavor Financial Planning, Holiday Inn Express – Stony Brook, Safeguard Print & Promo, Truehold Promotions powered by Proforma, Tsunis & Gasparis, LLP, and Windows on the Lake. Pictured l-r: Edward Glidden, Long Island MacArthur Airport; Jeff Freund, Greater Middle Country Chamber of Commerce; Barbara Ransome, Brookhaven Chambers of Commerce Coalition; Robert A. Schneider, Long Island Mac Arthur Airport; Shelley LaRose Arken, Long Island MacArthur Airport; Sophia Serlis McPhillips, Middle Country Public Library; Lisa Mitnick, People’s Alliance Federal Credit Union; Elizabeth Malafi and Ryan Gessner, Middle Country Public Library.